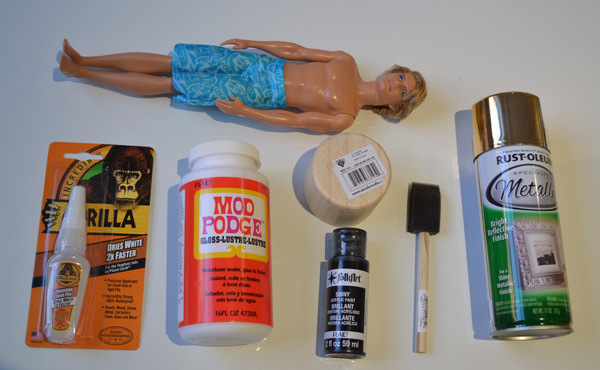 Make a DIY Oscars statue in minutes using a Ken doll & some paint. 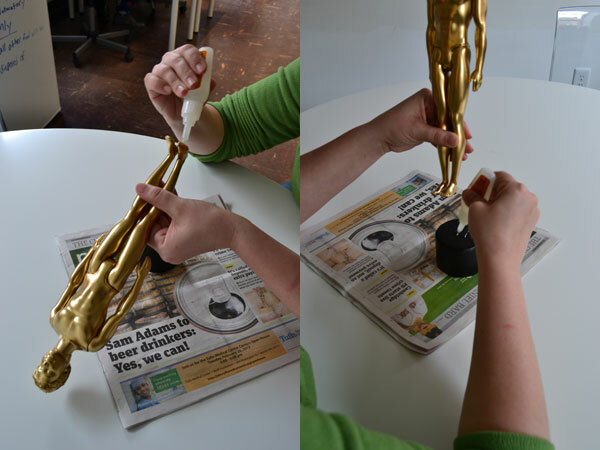 No Oscars party is complete with its own awards statue, and as we get ready for our annual #OscarUp tomorrow at 40Berkeley, we decided to create this DIY version of the iconic golden guy — using a Ken doll and some spray paint — in just a few minutes. Here's how we did it. 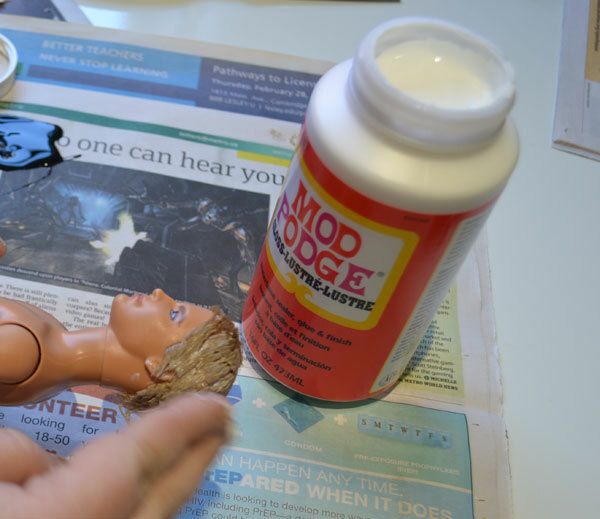 Once the Mod Podge is dry, it's time to give Ken the Midas touch. 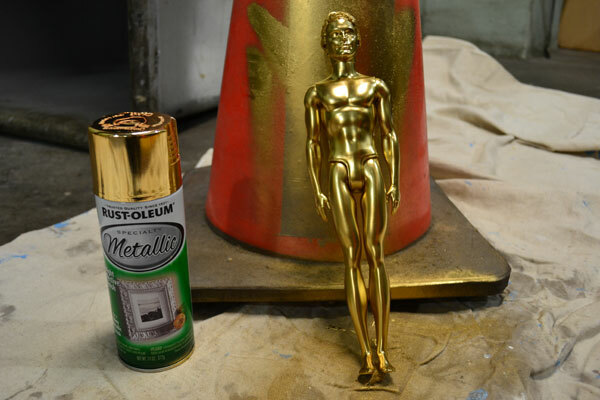 Prop Ken up and spray evenly with the Rust-Oleum Metallic spray paint (holding can approximately a foot away). Wait 8 to 10 minutes for the first coat to dry, then flip and spray Ken's back. Wait another 20 minutes until fully dry before attaching to the base. 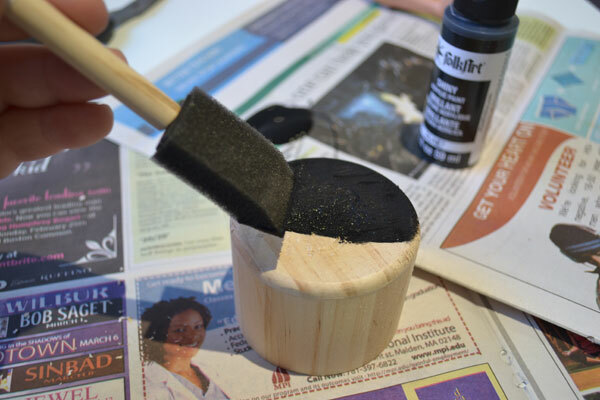 While waiting for Ken to dry, give your base two coats of the black acrylic paint. We picked up a $1 unfinished wooden base at AC Moore (after realizing that our planned Play-Doh container was too small for Ken's feet). Coat using a sponge or small brush, going with the wood's grain, and let dry 10 minutes between each coat. Once Ken and his pedestal are dry, lightly dampen the top of the wooden base before adding a small pool of Gorilla Glue . (I also added some Gorilla Glue to Ken's feet before securing him to the pedestal, which may have been too much — see below.) Press Ken firmly to the base for about 5 minutes to let the Gorilla Glue start to set, then place in a corner (so he can't fall over) and let dry at least a few hours (preferably overnight). Every maker knows that the first time you do a new project it never goes completely as planned, and our Ken/Oscar decided to pull a Toy Story and party a little harder overnight than we had hoped. (Doesn't his overflowing pool of Gorilla Glue look like Champagne foam?) Anyway, as our wise friends on Instagram pointed out, the joy of being a crafter is to "celebrate imperfection" — that's how you know it's made by hand! 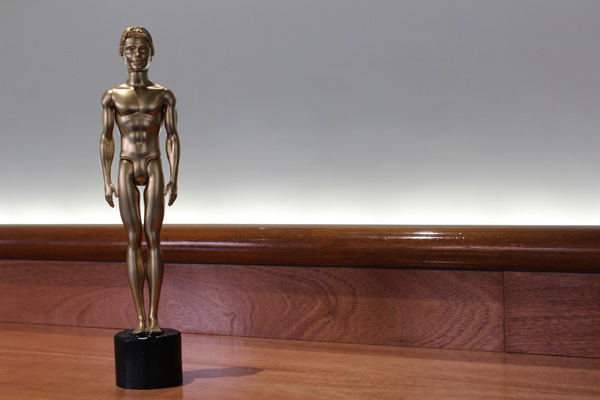 Come hang with us at our 4th Annual #OscarUp tomorrow, Sunday February 24 from 6 to 10 p.m. at Collaboratory 4.0, 40 Berkeley Street in Boston, and you can take a photo holding our Ken/Oscar!